So today is the end of the big weekend that kicks off holiday shopping and for some of us that meant waking up super early Black Friday to get great deals from Blowout Cards. Then there were some of us that were crazy enough (like me) to be up and out of the house at 3am to start shopping at American Eagle and JC Penney before Target opened at 5am. I know Sooz got a couple of things, which she can share with you later. I didn't get any baseball cards because I was out, but I got some great DVD's for $4 for the kids in the family, Monk Season 7 for $12.99 for myself, a new gym bag for 9 cents after coupons and gift certificate, and some down pillows for half price.... there is more boring stuff but we are supposed to talk sports. 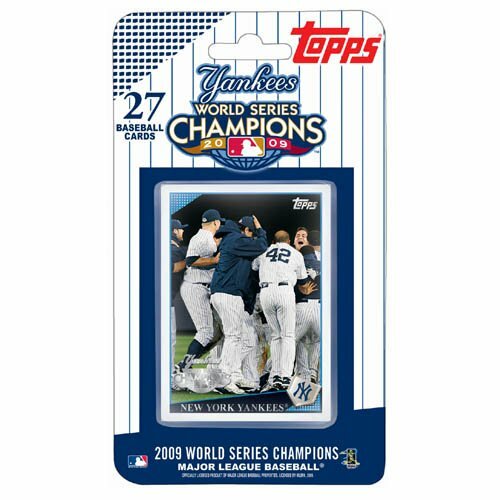 Oh wait, I did get the Yankees World Series set from Topps for me and my brother as stocking stuffers. I wrote a letter to Santa last night, maybe he will bring some cards. I didn't get anything. My family is doing everything (except for stocking stuffers) online this year. Ehhh I wish my family was into Black Friday shopping but there again it is really great to have a family that loves spending time with each other so much that they can't be bothered with shopping on Black Friday. Maybe next year I'll hit the stores, $0.09 for a gym bag is completely unbeatable! I got one thing: a nice 7" 1GB Digital Picture frame for my dad for Christmas for $50. Since I am stationed in Germany, my dad doesn't see me, my wife or my son often (sometimes on webcam), so I am going to load it up with pictures and music and send it to him. I was up on black Friday, but not for shopping. I didn't go to bed until 7:30 a.m. because I thought it would be better to play poker in Atlantic City. Good times. So, as I was heading home, I saw tons of people headed for the malls. I did stop at Blowout Cards and bought one box of UD Doc (I really wanted the case, but I fell asleep by the time it went up), a retail box of Masterpieces and a box 2005 Donruss Champions. I was little slow on the SP Legendary and a little disappointed I didn't get it. Otherwise, all my xmas shopping was essentially done before Black Friday. that is a very cool gift for your dad. I thought about doing that for mom, but only cause she loves the grandkids more than her real kids. However, she gets to see them every day. I think your dad will love that. Didn't go near a store. I will be shopping during the early part of the week, when almost everyone else is at work, over the next few weeks. Peace and quiet and the ability to actually concentrate on what I'm buying is worth whatever I may lose in "deals" (and I don't believe I'll miss out on sales, as I never have in previous Christmases). No Black Friday up here. I went to work. I do the Boxing Day thing, which is as close as we get. Except its after Chriistmas. I went out in the afternoon and I didn't look/go after any deals. I did buy my mom some stocking stuffers though. Plus I bought myself some cards.